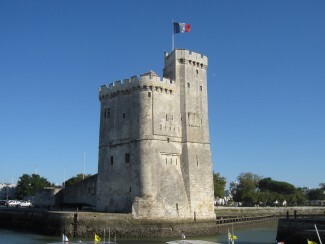 The two towers known as The Saint Nicolas Tower and the Chain Tower together constitute the majestic gateway to the Old Port of La Rochelle. 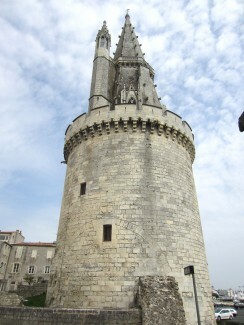 It was the duty of the slightly leaning and 42 m high Saint Nicolas Tower (named after the patron saint of sailors and built in the 14th century) to protect the entrance to the port and was connected to the Chain Tower by a huge chain which was stretched across at night to effectively close the port. The tower was built on a pentagonal plan with its five corners being reinforced by three engaged circular turrets, a rectangular turret and a higher square tower forming a keep. It was used as a prison both for the Huguenots during the time of the Revocation of the Edict of Nantes and later on also for the Chouans who remained faithful to the king during the revolutionary wars. An outside staircase which acts as a buttress leads up into the main room which is octagonal in shape and has elegant ribbed vaulting above. Other staircases lead from here to the second chamber and this in turn branches off into several rooms including a chapel and also out onto the lower parapet. 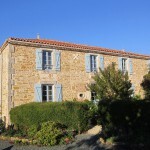 The upper parapet provides wonderful views of the entrance to the harbour, the bay and the Ile d’ Aix. Also built in the 14th century, this tower obviously derives its name from the huge and heavy chain which used to be stretched across the harbour mouth between this tower and the Tour St Nicholas at night. Originally this would have been effectively the Gateway to the Old Port. The Chain tower would have closely monitored all port traffic and boat movements and also collected taxes and dues. The Chain Tower was regarded as sacrosanct in the Protestant period and it was from this tower that the standard with the city’s colours was proudly flown. Originally there was in fact a turret attached to the tower but this was demolished probably in the 17th century to widen the narrow channel entrance. For a long time the tower was used as a powder magazine and this directly led to it being severely damaged in 1652. After this, the tower remained empty for 3 centuries. It was only in the 20th century that the Tower was restored and given a new lease of life. The Lantern Tower isn’t quite as old as the other two towers dating from the 15th century although it probably replaced an earlier tower from the 12th century. This tower was built with functionality in mind and it served different purposes in the Middle Ages. One very important function it had was the control and disarmament of all ships entering the port, but more than this it would have been the central watchtower for the Aunis coastline and accordingly would have been responsible for the guidance of ships because it in effect acted both as a lighthouse and also a maritime navigation landmark. The walls of the tower are 6 m thick at the base and this contrasts starkly with the elegant octagonal spire and the fine lantern originally as used as the beacon which surmounted it. 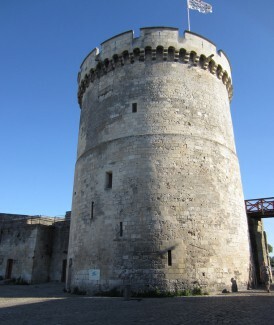 On the ground level you will find the old guardroom in which there is now an exhibition telling the history of La Rochelle in illustrated panels. Up in the spire there are four rooms one above the other. On the walls of these rooms you can still see 600 pieces of graffiti carved by soldiers as well as prisoners mainly dating from the 17th and 18th centuries. In the 16th century, the Lantern Tower was used as a prison, firstly for priests. Then until the 19th century, it held English prisoners captured from their ships, and also in the 17th and 18th centuries, it held prisoners from the Vendée region who were seized during the Wars of the Vendée. The more interesting scrawlings are nowadays protected by glass. Upon the second level of the spire there is a projecting balcony which gives a wonderful panorama over the rooftops of the old town, the port and out towards the ocean. The Lanterne Tower remains the oldest lighthouse on the Atlantic coast. • Self-guided visits: allow 30 minutes to 1 hour per Tower.